georgetown media's Nicholas Feustel is also an accomplished writer and journalist, in both English and German, with outputs that include 'how to' handbooks and regular columns on two of his areas of expertise – HIV, and the German TV industry. The People Living with HIV Stigma Index measures changing trends in relation to stigma and discrimination experienced by people living with HIV. Although the process is considered to be just as important as the product, the quantitative data it provides can sometimes miss some of the qualitative experiences. 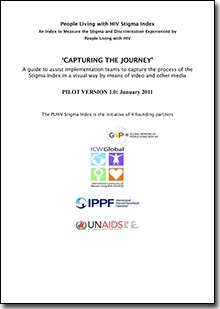 This handbook, commissioned by Global Network of People Living with HIV (GNP+) as a downloadable A4 PDF in English, was conceived and written by Nicholas to assist in capturing the process and motivate the implementation teams by using videos or photos to illustrate the 'human' aspects of the findings. For an example of 'Capturing The Journey' in action see: 'Conclusions of the interviewers'. 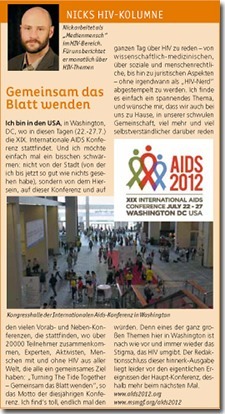 This video georgetown media made for the German rollout of the PLHIV Stigma Index. HIV testing, prevention, care and treatment. provides links to websites for further detailed information. Nicholas has been K7 Media's correspondent for the German TV market since 2010 writing a weekly column (in English) about 'what's hot' in German TV. K7 (www.k7media.co.uk) is a Manchester-based agency that collects data and provides information for the international TV business.